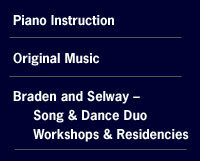 " The song and dance performances of the duo, Braden and Selway, are a pure delight. The moment the two appear, the audience is captivated. Braden and Selway enjoy their work, and their interaction with the audience. The music, songs and choreography are smooth, a lot of fun, and cohesive. In the tradition of the great song and dance teams of stage and film, Dianne Braden and James Selway recreate songs and dances from Hollywood musicals and from Broadway musical classics. 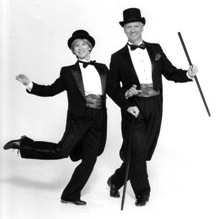 They appear frequently at clubs, churches and senior residences performing a rich repertoire of show-stopping numbers featuring tap, ballroom dance, and vocals. Their shows can be tailored to meet the needs of your group…from thirty minutes to an hour. Braden and Selway specialize in doing numbers that include audience participation.